Maeda USA, along with Maeda Seisakusho Japan and AB Kranlyft, presented several new Mini Crane models at Bauma. Maeda showcased new models at the exhibit, including the new generation MC285-3, as well as upgraded MC305-3 and MC405-3 models – all of which will soon be available in North America. Also featured were several international models not yet available here. 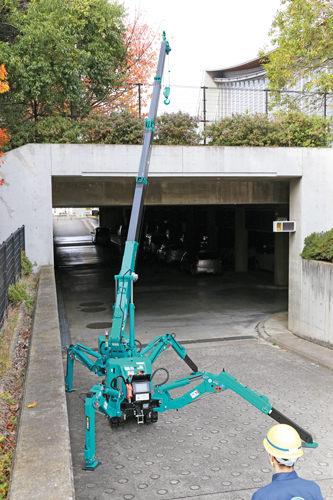 The updated MC285-3 now includes multi-angle outriggers, a state-of-the-art wireless remote control, new generation touch screen moment limiter safety system, and a removable electric motor package for maximum versatility – all while maintaining single doorway access to buildings. Also on display were the newly upgraded “-3” versions of the MC305-3 and MC405-3, featuring multiple design and functionality upgrades. Information was also be available on the new MC090 model, Maeda’s 885 kg capacity mini crane, and the new 2,675 kg capacity MC270 model. Based in Houston, Texas, Maeda USA is the North American distributor for sales, rentals and service for all Maeda products.